In the period in which the New Testament was written the Jewish Scriptures were written on several large scrolls usually made of parchment, rather than in a single ‘book’ as we know it. These texts were not put into book form, or codices (singular codex), until considerably later. Codices/books were used in this period, but these were mainly made of papyrus and used for taking notes. Parchment was more expensive than papyrus and therefore reserved for more important texts. Notes might be written on papyrus, but valuable texts which were intended to last longer would be written on parchment. Biblical scrolls were large and it would not have been possible to carry around the whole ‘Bible’ as we know it. 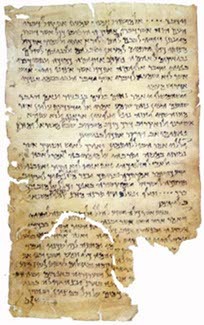 There is evidence from the dead sea scrolls and later Christian literature that several biblical quotations were sometimes grouped together thematically and copied onto a single parchment. These are known as ‘testimonia’ or ‘florilegia’ and the dead sea scrolls includes two Jewish examples including one (4Q175 or 4QFlor, the Florilegium) which is a series of five quotations from the Hebrew Bible about a messianic or prophetic figure, with a pesher or commentary on the last quotation. There are good reasons to believe that some of the writers of the New Testament used similar testimonia as the source of their quotations rather than copying directly from a biblical scroll. For example, some scholars suspect that Romans 3:10-18, which appears to be a lengthy quotation from a single source (in fact, the lengthiest quotation in Paul’s letters), was actually making use of a testimonia. This ‘quotation’ is actually a chain of quotations from several biblical texts (a catena): Psalm 14:1-3, 5:9, 140:3, 10:7, Isaiah 59:7-8 and Psalm 36:1 (references are to the English versions as chapter and verse numbers differ in the LXX and MT). There are two possibilities for the source of Paul’s ‘quotation’: (1) this chain of texts was Paul’s own composition, or (2) Paul was quoting from a Testimonia which had been produced earlier by another writer. It is possible that among the “books and parchments” which Paul asked Timothy to bring with him were such testimonia which Paul had collected or arranged himself, or notes which he had taken at those times when he had access to actual biblical scrolls. Either way, this text in Romans 3 illustrates how that New Testament writers felt no sense of obligation to quote Scripture precisely, and it was even possible to ‘rework’ Scripture by bringing together several texts thematically to create something new. 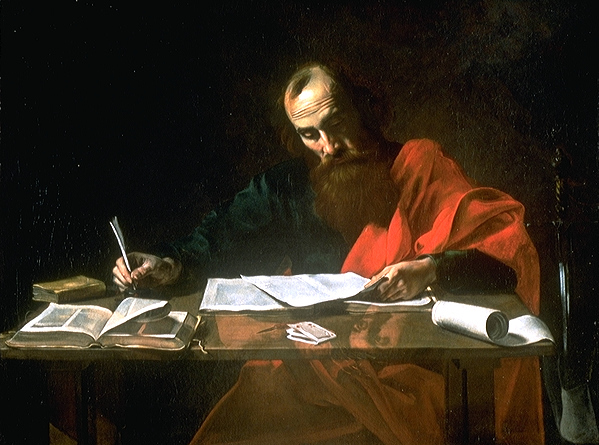 Remarkably, Paul could introduce his chain of texts with the words “it is written” even though that particular arrangement of biblical texts was not actually written anywhere in Scripture. This entry was posted in New Testament Quotations from the Hebrew Bible, Septuagint. Thanks Paul. The point Frank Selch makes about the words in Romans 3 being written back into the LXX at a later time is an important one, and one that I intend to deal with in a later post in this series. The ‘Christianisation’ of the LXX became such a problem for Greek-speaking Jews that it was probably the primary reason why they eventually abandoned their use of the LXX altogether. Good and agree. I discuss this in my book on the NT & the LXX as well. Steve, A slight chuckle at your picture but probably had little to choose from. :) Shows Paul with a book and a pen; most likely had neither of these. Thanks for the article. Good spot David! You’re definitely right about the book – that one looks a bit anachronistic to me as well, but the pen might very well be a quill with the barbs stripped off, which I think may have been the custom. Quill pens were a tad before my time, although I was in the last class at school to use dip pens before László Bíró’s ballpoint pens became ubiquitous. I still prefer to write with a fountain pen. Here is an interesting picture by Van Dijk of a bookkeeper sharpening his quill.